Schutzhund (German for "protection dog") is a dog sport that was developed in Germany in the early 1900s as a breed suitability test for the German Shepherd Dog. The test would determine if the dog displayed the appropriate traits and characteristics of a proper working German Shepherd Dog. Today, it is used as a sport where many breeds other than German Shepherd Dogs can compete, but it is a demanding test for any dog that few can pass. There are three Schutzhund titles: Schutzhund 1 (SchH1), Schutzhund 2 (SchH2), and Schutzhund 3 (SchH3). SchH1 is the first title and SchH3 is the most advanced. Additionally, before a dog can compete for a SchH1, it must pass a temperament test called a B or BH (Begleithundprüfung, which translates as "traffic-sure companion dog test"). The BH tests basic obedience and sureness around strange people, strange dogs, traffic, and loud noises. 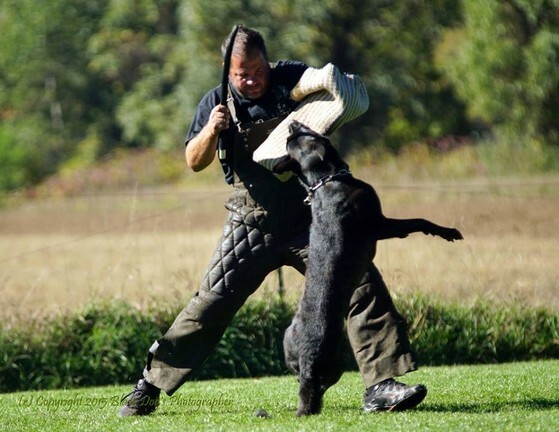 A dog that exhibits excessive fear, distractibility, or aggression cannot pass the B and so cannot go on to compete in higher levels of Schutzhund. In the protection phase, the judge has an assistant, called the "helper", who helps him or her test the dog's courage to protect itself and its handler and its ability to be controlled while doing so. The helper wears a heavily padded sleeve on one arm. There are several blinds, placed where the helper can hide, on the field. The dog is directed to search the blinds for the helper. When it finds the helper, it indicates this by barking. The dog must guard the helper to prevent them from moving until recalled by the handler. There follows a series of exercises similar to police work where the handler searches the helper and transports them to the judge. 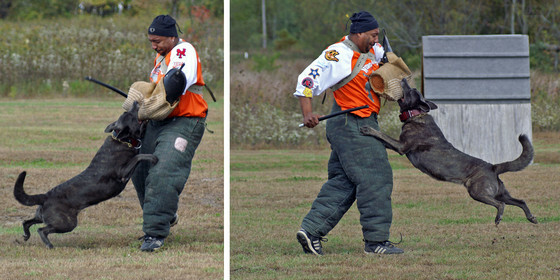 At specified points, the helper either attacks the dog or the handler or attempts to escape. The dog must stop the attack or the escape by biting the padded sleeve. When the attack or escape stops, the dog is commanded to "out," or release the sleeve. The dog must out or it is dismissed. At all times the dog must show the courage to engage the helper and the temperament to obey the handler while in this high state of drive. Again, the dog must show enthusiasm. A dog that shows fear, lack of control, or inappropriate aggression is dismissed. This article uses material from the Wikipedia article SCHUTZHUND. DVG stands for Deutscher Verband der Gebrauchshundsportvereine, or the German Association of Working Dog Sport Clubs. 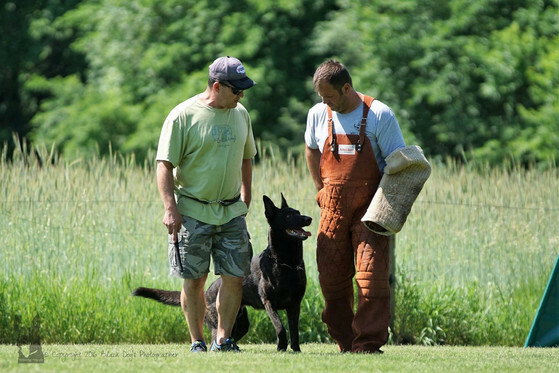 DVG is the oldest and largest Schutzhund training organization in the world. Begun in 1903, DVG was Germany's first police and service dog club and has now grown to nearly 30,000 members. DVG exists for only one purpose -- training and titling dogs of all kinds. In addition to Schutzhund and advanced tracking degrees, it offers obedience and tracking titles, providing competition opportunities for all people who love to train dogs, even the smallest of breeds. DVG is made up of fourteen geographic regions (Landesverbands), thirteen of which are in Germany. The fourteenth is LV DVG America. The American Landesverband is divided into four local regions (Kreisgruppen), whose presidents sit on the LV Board. Click on the following links for additional information and forms.